I host a Galentine's party every year and have done different themes along the way, but I always come back to decorating cookies. I don't know why! Maybe I just enjoy it, so I force everyone to do it with me, or maybe they like it too. 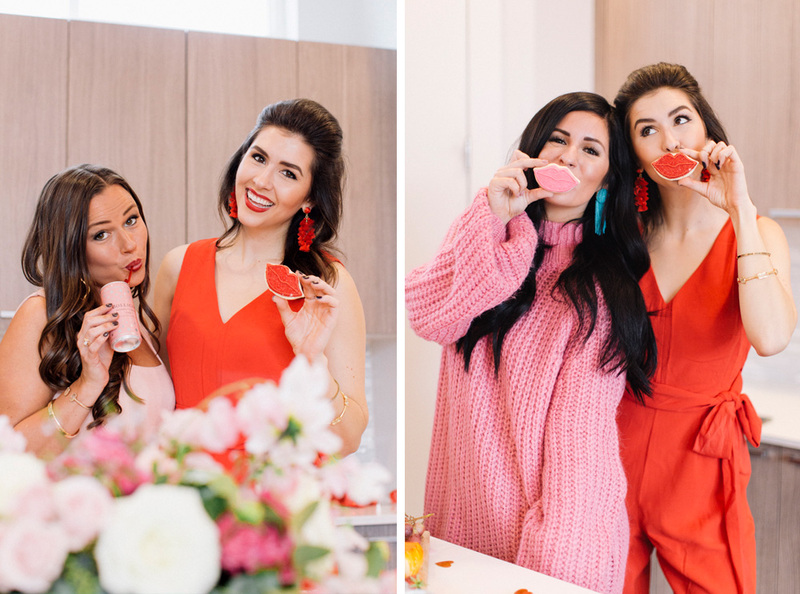 Idk, but these photos sure are cuuute and I'm going to tell you my Galentine's secrets so you can host your own event in time for Galentine's Day this year! 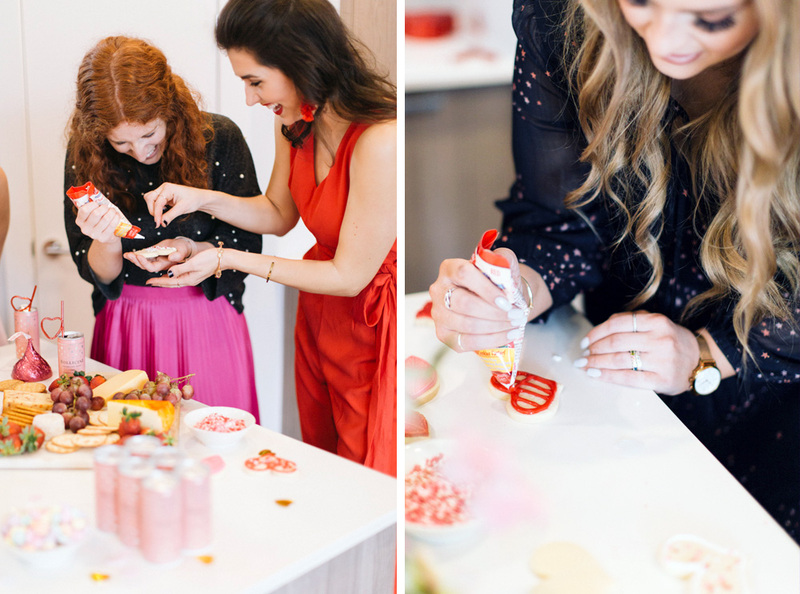 Even if your gal pals are married or dating, you can still celebrate Galentine's with them! It's not just for single ladies! The hardest part of Galentine's is finding a time to do it! Coordinating schedules is always the hardest part of event planning, so just be prepared to have a few friends who won't be able to make it. You only need A FEW supplies for Galentine's. Please trust me on this and resist the urge to buy the entire Valentine's section at Paper Source or the whole themed candy aisle at Target. Promise it will be ok- step away from the heart-shaped Reese's (actually grab those, but leave everything else!). Of course, since I knew that we were taking photos, I grabbed a few extras that I didn't need (story of my life!). Another extra that I always love to have for events is a beautiful floral arrangement like this one from R. Love Floral (one of my faves in Dallas!). It doesn't have to be fancy, but you do have to have something for your guests to drink! 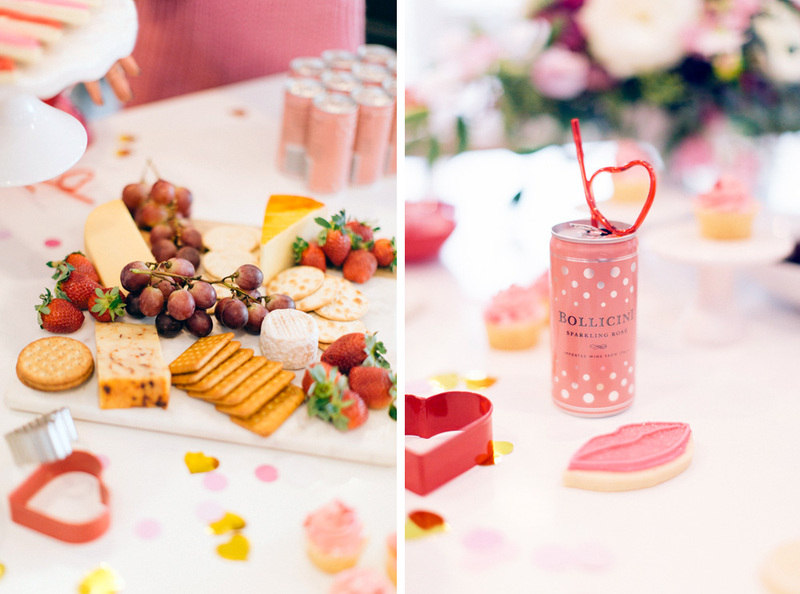 I'm a fan of these adorable pink cans of sparkling rose, and so were my guests! I love killing two birds with one stone, so if it's the beverage and it's a themed accessory- all the better! 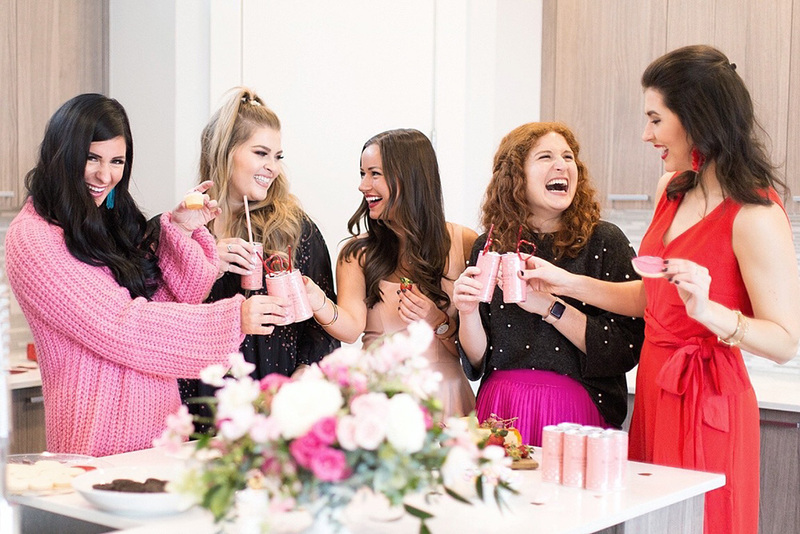 A lot of Galentine's events focus on wine, BUT don't forget to have a non-alcoholic option that's also fun for guests to drink! Topo, Prickly Pear Italian Soda (it's a thing. ), pink lemonade...all good options. Maybe it's a pizza party, or maybe it's a cookie decorating party, so your snack is built in! I like to keep my snacks simple because something happens to my brain when I go grocery shopping for ONE snack, and then I end up with 19 cheeses and 7 assorted crackers for my simple charcuterie board. Plan ahead to avoid a Rhonda-style disaster at the grocery store and having to camp out in aisle 2 while you browse Pinterest for a new plan. One snack. One Snack. I actuallyyy like to have one savory and one sweet. I usually end up with a chocolate (Reese's), a gummy (sugarlips from Sugarfina) and a cookie. Of course, since this was a cookie party, we had tons of cookies! How ADORABLE are these sugarlips cookies by Cookie Whipped? 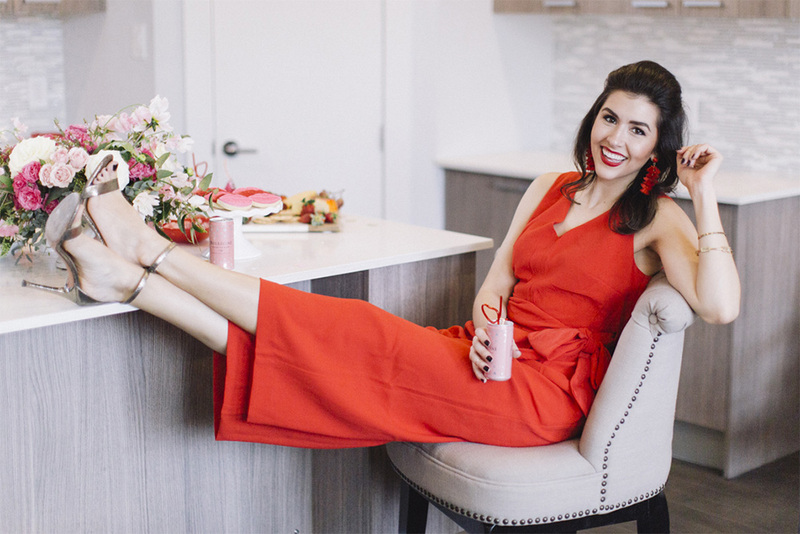 They are my go-to custom cookie spot in Dallas and they're just as delicious as they are cute! If taking photos of sugarlips cookies doesn't count as an activity, then idk what you're doing. 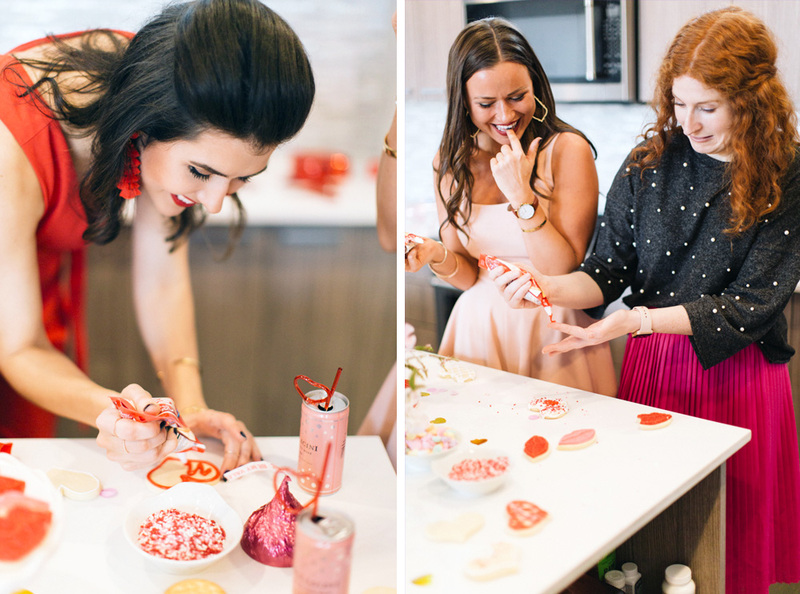 ;) Cookie decorating is an easy activity, but you could easily make it a game night, a movie night, clothing swap, floral arranging class, or anything you want! Cookie decorating is always comical because you find out who cares more about decorating than eating, and vice versa, and you usually discover someone's hidden talent! One of the girls was creating beautiful cookies and then she casually mentioned that she used to work for a cake decorator! As the event host, it's your job to set the tone for the event. If you're stressed out, your guests will be stressed out. If you're enjoying yourself, your guests will know it's ok to let loose and enjoy themselves as well! 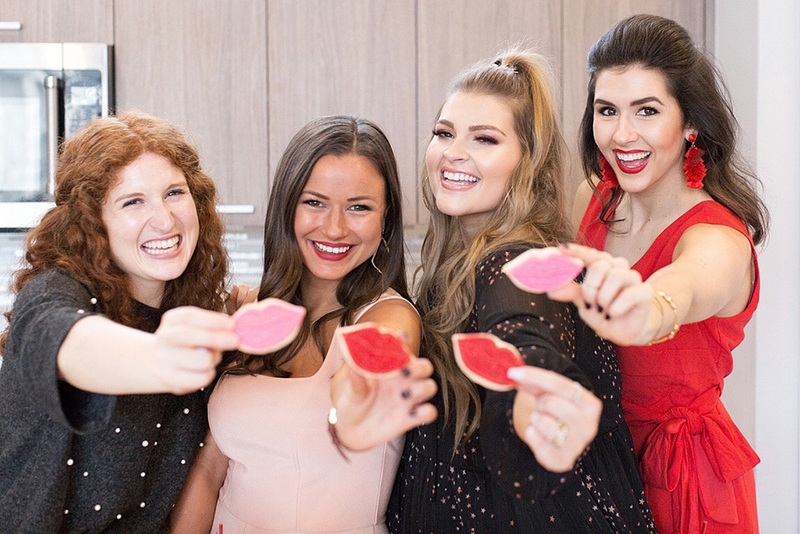 I always have to remind myself to RELAX and enjoy and that at the end of the day, the girls don't care if the cookies are perfect, but they do care about having a good time with their friends. Loved celebrating with these sweet friends! Lynlee, Molly, Rachel, and Molly! Photos by Kaylynn Krieg Photography for The Skinny Arm. 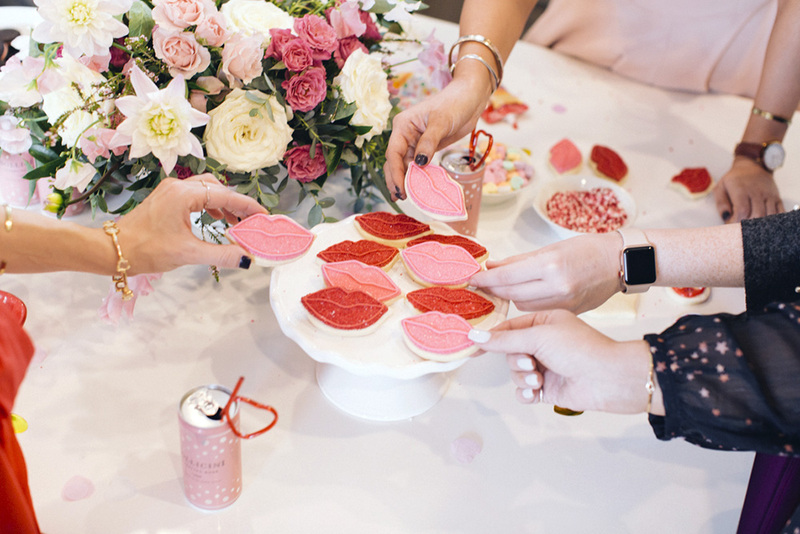 Special thank you to R. Love Floral and Cookie Whipped for helping make Galentine's beautiful!